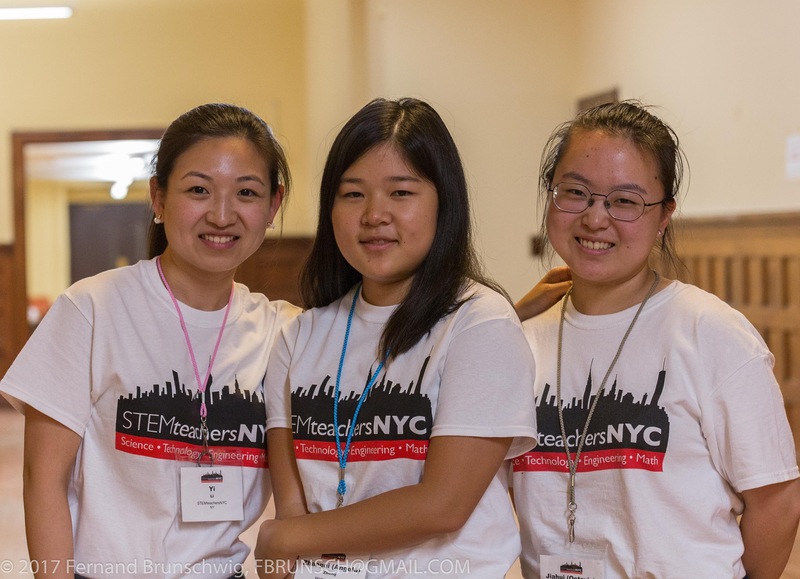 This summer, STEMteachersNYC high school interns Octavia Zhao, Angela Zheng, Wenny Xu, and Tim Li helped to engage our teacher network, and document some of the amazing learning that occured during our STEM workshop series in July and August. This was the third year that we hosted high school interns. This year was an international cohort of students from China and different parts of the US. In addition to getting involved in our routine operations, under the supervision of our staff, they also actively solicited feedback from workshop leaders and teachers. Our interns played a key role in documenting important moments of learning and exchange through videos and reports that help the organization gain a better understanding what teachers think and to continuously improve the quality of our workshops. ● Developing a framework or domains of knowledge that a workshop leader is required to know- Leadership Pedagogical Content Knowledge. ● Utilizing technology to allow participants to engage in activities online. Those activities include, but are not limited to reading and discussing Modeling theoretical and conceptual articles, ways of addressing recurring problems, logistics of running a workshop, and expressing and resolving participants’ individual opinions and concerns. This will also make it easier to manage the nature of the diverse discussions by grouping participants based on their experiences, grade level, and subjects. ● Taking good use of the five face-to-face days to give participants more opportunities to practice as workshop leaders, critique, and reflect of their practice as a group. ● Supplying the participants with tangible sources from which to gather resources, if this is expressed as a need from the participants. Establishing a forum as a shared repertoire of resources for workshop leaders, including stories, tools, logistics to run workshops, ways to apply for grants, cases of addressing recurring problems. ● Creating spaces for participants to continue interacting with each other and reflect their practices, especially after they have experience as workshop leaders. Documenting a Summer of STEM Learning!